I have this figure in which motion is given to revolute joint in Simmechanics. In this, constant 2 is used and then integration is used. I want to know what will be effect of 2 here and how integration is happening. What is the actual value of input here. Is it 2 degree or 2 degree/sec or something else. 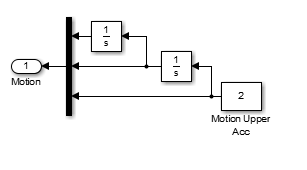 Is 2 is the upper limit of motion or lower limit? What will happen if replace 2 with 5. 2 represents a constant acceleration of the revolute joint. It's unit of measure cannot be determined from this screenshot, since it is a parameter of the joint actuator (to my knowledge it can be set to deg/sec^2 or rad/sec^2). It effect is a constant acceleration to the joint. Let's assume that in the joint actuator block the unit of measure is set to deg/s^2. It this case your mechanism will rotate with an increasing velocity. After 1 second of simulation time the velocity will be 2 deg/s. After 2 seconds of simulation time its velocity will be 4 deg/s. and so on. There is no limit to what the velocity will reach, the longer the simulation time the faster your mechanism will spin. Not the answer you're looking for? Browse other questions tagged matlab simulation simulator or ask your own question.